With a floristic name (translated as “golden daisy”) that belies its deadly nature, Russia’s Khrizantema-S supersonic anti-tank missile was designed to destroy current and future main battle tanks, including those protected with explosive reactive armor, small-displacement surface vessels, low-flying aerial targets and field fortifications. The Khrizantema’s 9M123 missile travels at an average speed of 400 m/s and has a range of between 400 and 6000 meters.The system is also unique among Russian anti-tank guided missiles in that, depending on the variant, its missile can either be guided by laser or radar. Each missile carries a tandem high explosive anti-tank warhead with a reported penetration of 1.2 m homogeneous armor behind explosive reactive armor – an absolute record. By contrast, America’s much-touted Javelin anti-tank missile which the Ukrainians are so eager to get, boasts maximum penetration capacity of just 70 centimeters. Israel’s Spike-MR/LR missile does a bit better cutting through 1 m of armor but is still no match for its Russian analogue. Khrizantema-S tank destroyer, based on the BMP-3 chassis. Its dual guidance system ensures protection against electronic countermeasures and operation in all climatic conditions, day or night. 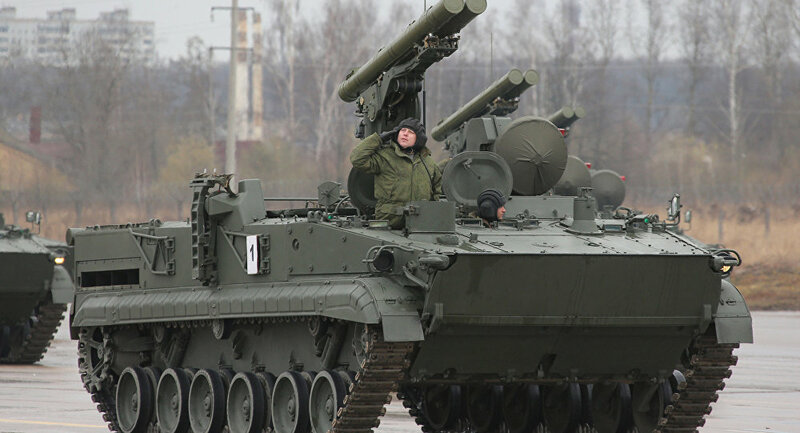 The system entered service with the Russian armed forces in 2005.